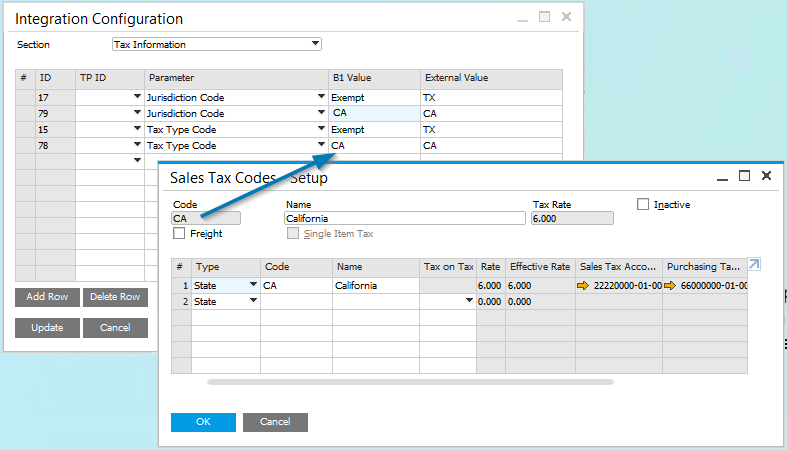 Use this option to configure Tax Jurisdiction Codes and Tax Codes for SPS Cloud EDI. The “Tax” option for Integration Configuration is used for mapping Tax Jurisdictions in SAP Business One Sales (Configured in Administration > Setup > Financials > Tax > Sales Tax Jurisdictions) to SPS Tax Jurisdiction Codes and the Sales Tax Codes in SAP Business One (Configured in Administration > Setup > Financials > Tax > Sales Tax Codes) to SPS Sales Tax Codes. The SPS Tax Jurisdiction Code represents the City, State or Province (tax authority) associated with the tax group. The SPS Sales Tax Code represents the type of tax applicable to commodities and services. Refer to the SPS Qualifier List for Tax Type Codes. The Integration Configuration screen can be opened in SAP Business One: SPS Integration > SPS Integration Setup > Integration Configuration. See the screenshot below for an example of mapping Tax Jurisdiction Codes. Tax Jurisdictions must be defined as shown in this example. Tax Types must be defined as shown in this example.